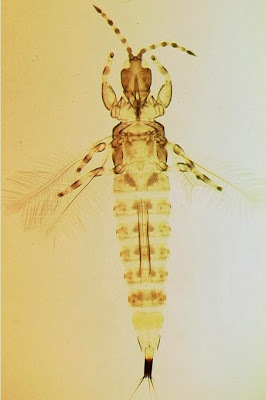 Female Neurothrips magnafemoralis, from Thrips of California 2012. Contains: Macrophthalmothrips, Acanthothrips, Adraneothrips, Hoplandrothrips, Malacothrips. The Phlaeothripini as recognised by Priesner (1960) is an assemblage of fairly generalised thrips; as such, it is probably of questionable monophyly. Similarly, the subtribe Phlaeothripina was distinguished only by its lack of the features of other subtribes, such as the bent or kinked wings, rough sculpture and anteriorly-extended head of most Stictothripina. Characters (from Priesner 1960): Cheeks often bearing small seta-bearing papillae, though these may be rudimentary or absent; cheeks often bearing a pair of spines in the basal third. Mouth cone usually, but not always, pointed. Maxillary stylets usually closely approximated at the midline. Eyes usually large, oval. Wing of even width or very slightly narrowed, rarely constricted. Body bristles, even those at the front corners of the prothorax, usually well developed, usually capitate. Femora and/or tibiae often with tooth formation in one or both sexes. Body surface often finely reticulate. Phallus usually haplothripoid. [G27] Girault, A. A. 1927. A discourse on wild animals. Privately published (reprinted Gordh, G., A. S. Menke, E. C. Dahms & J. C. Hall. 1979. The privately printed papers of A. A. Girault. Memoirs of the American Entomological Institute 28: 216-217). [G30] Girault, A. A. 1930. New pests from Australia. VIII. Privately published (reprinted Gordh, G., A. S. Menke, E. C. Dahms & J. C. Hall. 1979. The privately printed papers of A. A. Girault. Memoirs of the American Entomological Institute 28: 273-277). [M83] Martin, N. A. 1983. Miscellaneous observations on a pasture fauna: An annotated species list. DSIR Entomology Division Report 3: 1-98. [MM96] Mound, L. A., & R. Marullo. 1996. The thrips of Central and South America: an introduction (Insecta: Thysanoptera). Memoirs on Entomology, International 6: 1-487. [MP83] Mound, L. A. & J. M. Palmer. 1983. The generic and tribal classification of spore-feeding Thysanoptera (Phlaeothripidae: Idolothripinae). Bulletin of the British Museum (Natural History): Entomology series 46 (1): 1-174. [P60] Priesner, H. 1960. Das System der Tubulifera (Thysanoptera). Anzeiger der Österreichischen Akademie der Wissenschaften Mathematisch-Naturwissenschaftliche Klasse 13: 283-296.